When Ronald Reagan was elected in 1980, the popular belief was that the size of government would be cut and that some of the regulatory excesses of the prior decade would be rolled back. However, the growth of the federal government continued throughout the Reagan presidency and no agencies were phased out. What were the apparently powerful forces that rendered most of the bureaucracy impervious to reform? In this book, professional economists and lawyers who were at, or near, the top of the decision-making process in various federal agencies during the Reagan years discuss attempts to reign in the bureaucracy. Their candid comments and personal insights shed new light on the susceptibility of the American government to bureaucratic interests. This book is required reading for anyone wishing to understand the true reasons why meaningful, effective governmental reform at the federal level is so difficult, regardless of which political party controls the White House or Congress. Antitrust Policy in the Reagan AdministrationPyrrhic Victories? Civil Aeronautics Board SunsetSunrise at the Department of Transportation? When Reagan was elected in 1980, there was popular belief that the size of government would be cut, that some of the regulatory excesses of the prior decade would be rolled back, and that agencies would be abolished. But the growth of government has continued, and no major agencies have been phased out. Regulation is a highly profitable way to socialize the costs of cartelizing an industry. Government agencies limit competition, raise prices, or reduce output where the private costs to cartelize would otherwise be too high. Despite health, safety, and other claims, regulation is the triumph of special interests over the public interest. For example, as of May 1979, the excess cost of petroleum price controls to the consumer was $2.5 billion per year. Regulation by the Interstate Commerce Commission alone resulted in an annual $1 billion in monopoly wages to trucking union members and an additional $2 billion to company certificate owners. Under deregulation, airline travelers save $6 billion annually through lower fares and better service, and shareholders have improved their annual earnings by $2.5 billion. Similarly, petroleum decontrol has reduced the nominal price of regular unleaded gasoline by one third. From 1982 to 1983 alone, deregulation resulted in increases in labor productivity of .2 percent in the private, non-farm sector, whereas regulation formerly caused 12 to 21 percent of the decline in labor productivity between 1973-76 and 1958-65. On no other policy question is there greater consensus among professional economists than on the superiority of international free trade. Yet bowing to special interests the Reagan Administration s resistance to protectionism was dismal at best. James Watt specifically opposed privatization of federal lands and resisted the original proposal to sell off 5 percent of non-sensitive lands. He instead sided with the same western Democratic governors who opposed President Carter s earlier efforts to cut federal water projects. The Reagan Administrations major deregulatory success, telecommunications, resulted from a successful marriage of ideology with interest group pressures. But the local interest groups that made this success possible have now stalled any further efforts at greater competition in the telecommunications industry. The regulatory system results in the political extortion of milker or juice bills where businesses must contribute to powerful politicians or risk retaliation through he imposition of costly regulations. The entrenched bureaucracy, along with the Civil Service System, erects nearly insurmountable reactionary barriers against any genuine regulatory reform. Professional bureaucrats attempt to destroy any voices who prove effective in mobilizing people to reduce an agencys program, regardless of how beneficial such reduction might be for the general public. Was the so-called Reagan Revolution a disappointment? Many of the Administration s friends as well as its opponents think so. But under what criteria? To what extent? And why? As President Reagan s final term wanes, these questions seem worth pondering. The Independent Institute book does just that. 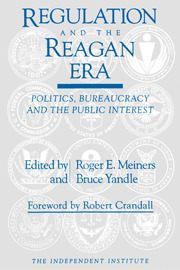 Entitled Regulation and the Reagan Era: Politics, Bureaucracy, and the Public Interest , this volume of fourteen essays is edited by Roger E. Meiners and Bruce Yandle. Meiners is Professor of Ecoinomics at the University of Texas at Arlington and Yandle is Alumni Professor of Economics at Clemson University. Both served during the Reagan Administration with the Federal Trade Commission (FTC). The rest of the books seventeen contributors are either professional economists or legal scholars who held policy-making posts in various federal agencies during the Reagan Era. They thus provide a unique combination of sophisticated theoretical knowledge and real-world bureaucratic experience. Robert W. Crandall of the Brookings Institution, caps off the volume with a distinguished introduction. Regulatory reform is the explicit criterion against which this assemblage measures the Reagan Revolution. The contributors to this volume, write Meiners and Yandle in their introductory chapter, favor either deregulation or regulation that embodies a greater degree of economic rationality. Indeed, they are all well steeped in the public-choice insights of Nobel Laureate James Buchanan. Recognizing that politicians and bureaucrats display the same self-interested behavior as the rest of us, the authors appreciate why regulation invariably benefits those special interests with sufficient resources and power to influence government policy. The same concern troubles George W. Douglas (private consultant) and Peter Metrinko (attorney). Their contribution to Regulation and the Reagan Era foresees the Department of Transportation assuming the regulatory tasks of the defunct Civil Aeronautics Board. Still more pessimistic is Lloyd R. Cohen (George Mason University Law School), who discusses the International Trade Commission, an agency that Cohen considersdespite (or because of?) having worked therearguably the most socially costly. On no other policy question is there a greater consensus among professional economists than on the superiority of international free trade. Yet the Reagan Administrations progress in fighting protectionism was dismal at best. Particularly illuminating are the chapters on privatizing federal lands and deregulating telecommunications. At first glance these two cases appear diametrically opposite, constituting the Reagan Revolutions most conspicuous failure and success respectively. But the intricate interplay of state and national politics makes them similar. Robert H. Nelson (Department of the Interior) shows in the case of federal lands that the Administrations equivocal shift towards outright land sales in early efforts to balance the budget alienated western interests. The powerful Sagebrush Rebellion, sympathetic at first, came to fear that privatization would terminate the long-established access to the federal domain enjoyed by many Westerners. The Administration s fiscal imperatives thus threatened the livelihood of those possessing homesteaded rights to the public lands. The resulting inability to enlist the support of local interests ultimately doomed this deregulatory effort entirely. Expressing disappointment about the Reagan Revolution is one thing. There are and will soon be other books that do merely that. Explaining why Reagans deregulation did not live up to expectations is something else altogether. It is to this more challenging question that the five chapters in the third section of Regulation and the Reagan Era turn. In the process, they make intellectual contributions to public-choice theory. Public-choice traditionally has looked upon politicians and bureaucrats as power brokers, providing political privileges to those special interests willing to pay the most. This alone makes the prospects for regulatory reform dim. But the chapter by Fred S. McChesney (Emory University Law School) argues that the self-interest of politicians, in and of itself, encourages additional harmful legislation that benefits no outside group whatsoever. Elected officials have an independent incentive to use their political authority to extort campaign donations and other payments. Politicians also have strong incentives to be unprincipled and inconsistent, as the chapter by Richard L. Stroup (Montana State University) explains. Special interests, whether they are buying political privilege or simply protection from political extortion, are not going to waste money on legislators whose minds are already made up, irrespective of which way the legislator predictably intends to vote. Whereas McChesney and Stroup explore the incentives facing politicians, Roger A. Rogowsky (in his second contribution to the book) and Daniel K. Benjamin (Clemson University) explore the incentives facing bureaucrats. Rogowsky details how entrenched bureaucracies have successfully evaded the wishes of Congress and the President in order to pursue their own regulatory agendas. Benjamin presents a more theoretical model of bureaucratic inertia. At times, he writes, the system reminds one of a cluster of Lilliputians attempting to move an elephant . . . ; unless (almost) all the actors agree on a decision and push in the same direction, nothing happens. Together the chapters of Rogowsky and Benjamin suggest that one of the foremost institutional obstacles to regulatory reform is the Civil Service System. Perhaps the answer lies within the musings of Alan Rufus Waters (California State University, Fresno) in the final chapter of Regulation and the Reagan Era. Building on the hints strewn throughout the other chapters, Waters seems to imply that individuals within government can make a difference, but only if they are willing to forego personal short-term gain in order to sustain implacable integrity. But this timely and unique volume also clearly demonstrates that such ideological commitment within the corridors of Washington will be in vain, unless it is reinforced from the outside by mass public pressure that stems from an equal commitment and integrity. Both Research Fellows at The Independent Institute, Roger E. Meiners is Professor of Economics at the University of Texas at Arlington and Bruce Yandle is Alumni Professor of Economics at Clemson University.